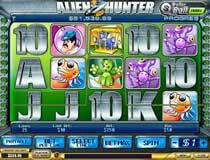 Alien Hunter is a 5 Reel, 25 Payline online video slot game. The game is based on a science fiction, intergalactic theme with ‘out-of-space’ sounds and animations. Features include the Alien Hunting Bonus Feature, an Egg Collecting Bonus Feature and a Dollar Ball Progressive Jackpot lotto style side game. Alien Hunter can be played for Free or Real money in various denominations. The maximum payout is 10,000 coins per line bet. The Wild Alien substitutes for other symbols to form winning combinations, except for the Spaceship scatter symbol. The Spaceship symbol may be scattered anywhere on the reels, as long as 3 or more Spaceship symbols appear. You can win up to 25 Free Spins when 3, 4 or 5 Spaceship scatter symbols appear anywhere on the reels. This will also trigger the Free Spin Bonus Round where you could win 5, 10 or 25 Free Spins respectively. When the Free Spin Bonus Round game ends, you will be taken back to the regular game and the Free Spin wins will be added to your win total. The Egg Collecting Bonus feature activates when the symbol appears anywhere on Reels 1 and 5. Enter a cave containing 15 eggs – then start clicking on the Alien Eggs. Some Alien Eggs contain money, a Bonus Prize or a Multiplier value multiplied by your line bet. Be careful because some of the Alien Eggs contain a baby monster which hatches and jumps out at you! When you click on the Evil Alien, the Bonus Feature game will end. 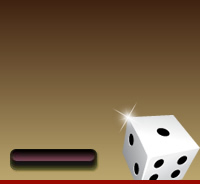 Should your first click be on the Evil Alien, you get to win a consolation prize and the game ends. Skill Bonus - Catch 6 Aliens within 10 seconds. The prize will depend on which Aliens you catch; some are faster than others and hold bigger prizes. Never mind if you cannot catch an Alien, you will still receive a consolation prize. Luck Bonus - The Aliens move around a bit slower and there’s no set time limit, and the Bonus Prize win will be determined randomly. Aladdin's wishes makes dreams come true with the help of his magic lamp. 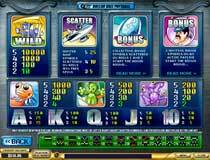 Make yours come true too with this great RTG Slot game. Ramesses Riches is a 5 Reel, 20 Payline Microgaming Bonus Video slot with exciting features such as double-payout wilds and triple-payout free spins.